An Unkindness of Ghosts by Rivers Solomon is hands down one of the best science fiction novels I’ve read in 2017. It’ll be released on October 3rd, 2017, so you don’t have long to wait! Until then, I’m fortunate enough to be able to bring you this interview with author Rivers Solomon! 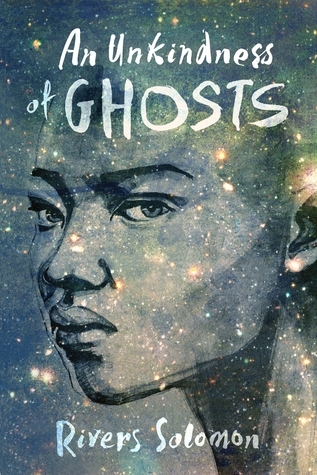 Can you tell us about your new science fiction novel, An Unkindness of Ghosts? Of course! I’m really excited to be at a stage where I can discuss the book freely and share it with the world. So far it’s been really fascinating seeing the various ways people talk about it. The summaries people use on various review and articles, while often clearly guided by the write-up in official marketing materials, reflect a range of points of view and impressions. I love that. I love how even at this early in the game, readers are leaving their own mark on the book based on their interpretations. All that said, An Unkindness of Ghosts is about a young, enslaved Black woman living in the steerage-deck slums of a generation ship in deep space and her investigation into the mysterious death of her mother decades prior. It touches on themes of gender, race, and generational trauma, but to me it will always be about a woman trying to figure out her past and how it relates to who she is. Can you talk some about the process of getting published? It was harrowing, to say the least, but it’s all worked out extraordinarily well and I could not possibly feel more blessed. Shortly after I signed with my agent, after we agreed that I’d make quick edits so we could go on submission before the summer season when publishing kind of takes a break, life really got away from me. I’d just brought my baby home for the hospital after the three months they were in the NICU, and I was going through a pretty intense gender-identity related crisis. I’d been very ill throughout my pregnancy, and it seemed to have permanently changed my body for the worse. I felt really ill.
Needless to say, the quick edits didn’t happen, and it was a little bit more than a year later until my book was ready to go on submission to editors at publishing houses (I made some pretty dramatic changes). I had been hearing lots of stories of books that never get picked up by an editor and that was so scary! I thought everything would be easy after I had an agent and had written what I thought was a very fine book, but that seemed not to be the case. Then I finally got the call that there’d been an offer from the Brooklyn-based press Akashic Books. The more I became familiar with them, the more I impressed I was and the more good I felt about having An Unkindness of Ghosts There. I felt they understood the book and what I was trying to do, and they do seriously good work diversifying the publishing world with very smart, needed books. I don’t think Unkindness could’ve found a better home. They’ve worked really tirelessly to make An Ukindness of Ghosts into a success, and I can already see the ways that it’s paying off. It is such an honor to see my book out in the world. It’s already being read and reviewed by complete strangers. What an experience. I was intrigued by the structure of An Unkindness of Ghosts, particularly how it included chapters in the first person POV of characters other than the protagonist, Aster. Why did you decide to structure the novel this way? The first first-person chapter I wrote was from a character called Giselle, who in the earlier versions of the book was a much smaller character. Even though I understood her, I felt that the protagonist, Aster, didn’t, so I wanted Giselle to have a chance to speak her truth so that readers had a chance to see where she was coming from. I found that chapter such a breath of fresh air to write so I decided to do it with some of the other characters as well. When writing a book, it’s really easy to get stuck in certain modes even though it doesn’t necessarily best serve the narrative, so I let myself experiment, and I think it turned out really well. In addition to the first-person chapters, I actively reminded myself to free myself in other ways, too. What was the inspiration behind An Unkindness of Ghosts? I’d been meditating on geography and diaspora and the idea of how living in space would change all of our notions of that. Star Trek was an inspiration, for sure, as was Battlestar Galactica. US history. Languages I’d studied in college. It’s hard to link it back to something singular, because in a way, my whole life had been leading up to that book. I loved how An Unkindness of Ghosts is set in the future but tied so firmly to our past and present. Oftentimes, science fiction can serve as warnings for what our societies can become. Do you view An Unkindness of Ghosts in this light? I prefer to think of it as a book about how we survive, because like you said, it is firmly tied to our past and present. The way things are is completely unacceptable. There are people alive today whose living conditions are worse than that of those in Unkindness. The horrors and oppressions discussed in the book are nothing new or that I invented. So I wrote An Unkindness of Ghosts as a tribute to all my ancestors who survived (and didn’t survive) unspeakable thing, and for myself, and for my siblings in arms. I really appreciated how An Unkindness of Ghosts centered around marginalized characters. Do you have any recommendations for other science fiction stories centering marginalized voices? I recommend Jamie Berrout’s Portland Diary, which is a collection of speculative short stories. She’s a brown trans woman and her stories feature that demographic. It’s beautifully written. I love anything by Nnedi Okorafor, but Who Fears Death is my favorite. Planetfall is fantastic by Emma Newman. There’s more out there, of course. I think one of the best things anyone can do if they really want to center marginalized voices in what they’re reading is to check out smaller presses and self-published authors. Do you have any current writing projects? Any other releases we should watch out for? I’m working on a lot of short stories at the moment! I have a million and one novels in progress, and am currently looking for “the one” that might be my NaNoWriMo project. To keep updated on my work, following me on Twitter @cyborgyndroid is a good idea, as well as supporting me on Patreon! This isn’t a question, but I also wanted to tell you how much I loved the queer representation in An Unkindness of Ghosts. I’m grey-aro ace, so Melusine’s chapter meant a lot to me. I am so glad! I have to tell you, it really didn’t require a special effort. It’s just a matter of painting a world that looks like the one I live in, one filled with people like my friends and family. I really wish it wasn’t so difficult to find diverse works. Like, yes, it’s out there certainly, but there is not enough of it. Rivers’ debut novel, An Unkindness of Ghosts—pitched as “a science fiction meditation on trans-generational trauma, race, and identity”—is forthcoming from Akashic Books. Like much of Rivers’ work, the book blends speculative and literary elements. Genre, like gender, is a social construct, but when pressed, Rivers considers their work in the tradition of afrofuturism. ​Though currently based in Cambridge, UK, where they live with their family, Rivers is originally from the United States. There, they received their BA in Comparative Studies in Race and Ethnicity from Stanford University in California and an MFA in Fiction Writing from the Michener Center for Writers at the University of Texas at Austin. They grew up in California, Indiana, Texas, and New York but spent much of their childhood wishing the mothership might come save them. Their literary influences include Ursula Le Guin, Octavia Butler, Alice Walker, Zora Neale Hurston, Ray Bradbury, Jean Toomer, Doris Lessing, and countless more.